The main difference between bile salts and bile pigments is that bile salts are cholesterol derivatives whereas bile pigments are by-products of the breakdown of haemoglobin in red blood cells. Furthermore, bile salts solubilize lipids in the food, improving chemical digestion while bile pigments give the unique, greenish-yellow colour to bile. Bile salts and bile pigments are two components of bile. Cholic acid and chenodeoxycholic acid are the primary bile acids in humans while bilirubin and biliverdin are bile pigments. Bile salts are polar cholesterol derivatives. They are synthesized in the liver and stored in the gallbladder. 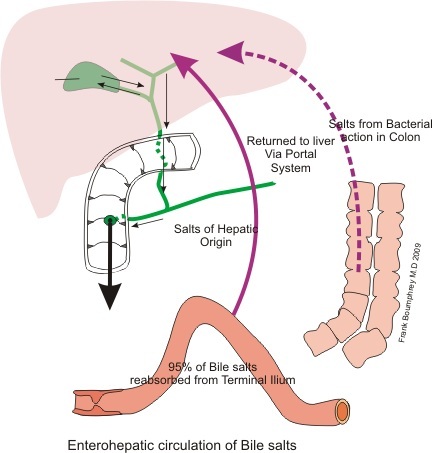 Bile salts are released to the duodenum and reabsorbed in the ileum. There are three main types of bile salts, depending on their level of synthesis. They are primary bile acids, conjugated bile acids, and secondary bile acids. Generally, bile acids are in synthetic form and become bile salts under the physiological pH. Hepatocytes directly produce primary bile acids from cholesterol. The two main types of primary bile acids in humans are cholic acid and chenodeoxycholic acid. 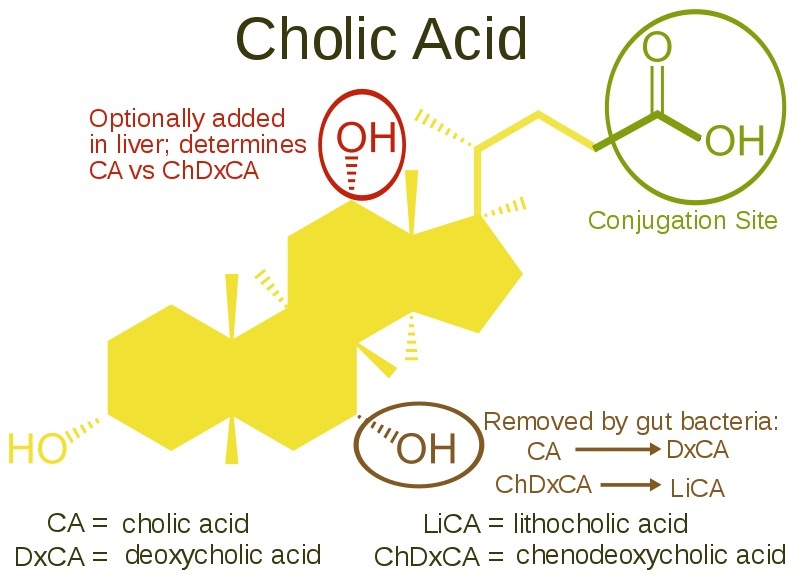 Before being secreted from the liver, 75% of the primary bile acids are conjugated with glycine, forming glycocholic acid and glycochenodeoxycholic acid. The rest of the primary bile acids are conjugated with taurine to form taurocholic acid and taurochenodeoxycholic acid. Conjugated bile acids are more hydrophilic than unconjugated bile acids, increasing the emulsifying capacity. In addition, this conjugation reduces the cytotoxicity of bile acids. On the other hand, secondary bile acids originate from the primary bile acids that are not reabsorbed by the ileum. Colonic microbiota is responsible for this modification and only 20% of the primary bile acids become secondary bile acids. Furthermore, bile salts are the functional major component of the bile, a greenish-yellow colour fluid produced by the liver. They are the major route of elimination of cholesterol from the body. However, the conjugated bile salts are strong surfactants as they form micelles with lipids. This increases the surface area for the enzymatic action of the pancreatic lipase. Bile pigments are another component of bile which gives the greenish-yellow colour to it. Bilirubin, which is orange in colour, and biliverdin, which is green in colour, are the two main types of bile pigments. In addition, their derivatives such as urobilinogen, urobilin, bilicyanin, and bilifuscin and stercobilin collectively give the characteristic brown colour to faeces. Unlike bile salts, bile pigments are eliminated from the body. They are by-products of the destruction of haemoglobin of old or defective red blood cells. Phagocytes destroy these red blood cells and they convert heme into free bilirubin, which is then secreted into the plasma. Albumin carries this bilirubin to the liver. Inside hepatocytes, free bilirubin conjugates either with glucuronic acid or sulfate. This conjugated bilirubin is then secreted into the bile. Inside the intestinal lumen, intestine microbiota metabolizes bilirubin and they are either eliminated through faeces or through urine after reabsorption. The excessive quantities of conjugated bilirubin in the extracellular fluid causes yellow discolouration in the skin. And, this condition is known as jaundice. Bile salts and bile pigments are two components of bile. Also, both play a unique function in the digestion of food. Bile salts refer to the steroid acids derived from cholesterol, which are synthesized in the liver while bile pigments refer to any of the colouring matters of the bile, derived from heme. 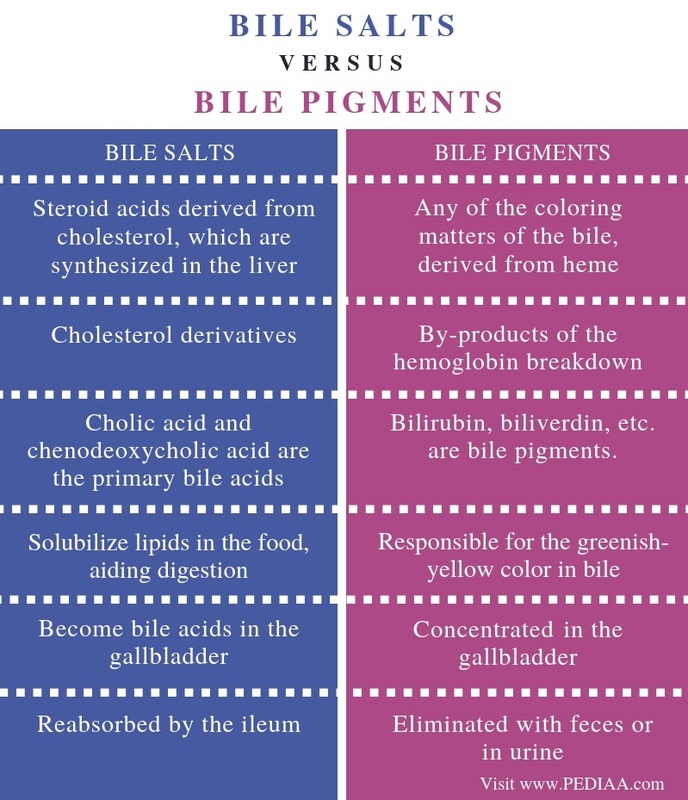 These definitions outline the difference between bile salts and bile pigments. Stemming from the above, the bile salts are cholesterol derivatives while bile pigments are by-products of the haemoglobin breakdown. Hence, this is the main difference between bile salts and bile pigments. Cholic acid and chenodeoxycholic acid are the primary bile acids in humans while bilirubin, biliverdin, etc. are bile pigments. Bile salts solubilize lipids in the food, aiding digestion while bile pigments are responsible for the greenish-yellow color in bile. Therefore, the function is a major difference between bile salts and bile pigments. Their fate in the gallbladder is another difference between bile salts and bile pigments. Bile salts become bile acids in the gallbladder while bile pigments are concentrated there. Also, ileum reabsorbes bile salts while bile pigments are eliminated with faeces or in urine. Bile salts are derivatives of cholesterol produced by the liver. 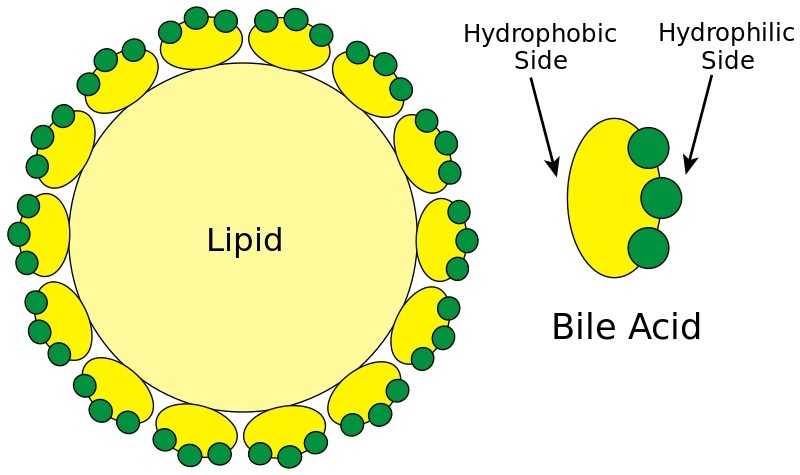 Conjugated bile salts serve as surfactants, which emulsify lipids in food. On the other hand, bile pigments are by-products of heme metabolism. Both bile salts and bile pigments are components of bile, which is stored in the gallbladder and secreted into the duodenum. Most of the bile salts are reabsorbed while bile pigments are eliminated from the body. Therefore, the main difference between bile salts and bile pigments is the type of molecules, role, and elimination.